My friend and former roommate Meredith was recently looking for some wedding shoes, and of course I had to do an extensive Google search to offer my advice. In my searches, though, I discovered the "wedding shoes" search on Etsy. Oh, my. I had no idea anything this...magnificent (?) existed. To the left you'll find my own personal design for Meredith's Wedding. I think it'll go nicely with her Unicorn Unitard. But I assure you, this design has nothing on the links you're going to see below. 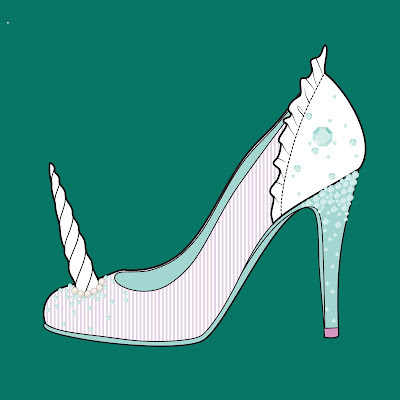 Follow the links to a bizarre wonderland of the craziest shoes that I am 100% sure people wear to their weddings. Please note, however, that I have not done business with any of these sellers, so I cannot vouch for their validity. Since I know the first thing you're thinking about right now is how you can get your hands on #10.